After an extensive bidding war at the Frankfurt Book Fair, with publishing rights sold into sixteen territories, Scott Bergstrom's The Cruelty is here. 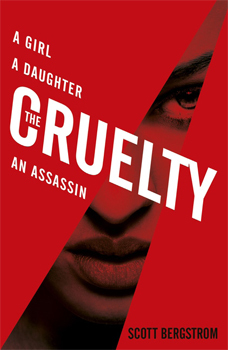 Originally self-published by Bergstrom, The Cruelty is not only being published worldwide but the film rights were quickly optioned by producer Jerry Bruckheimer (Pirates of the Caribbean, Top Gun) and Paramount Films. A gripping, edge-of-your-seat thriller, The Cruelty has been described as a YA Girl with the Dragon Tattoo meets The Bourne Identity, with a dash of Homeland. Featuring a strong heroine searching for her father and her own identity (no matter how high the body count), The Cruelty is sure to hook not only YA fans, but readers who love heart-racing stories. Bergstrom is currently working on a sequel, The Greed.